Louis F. and Isabell F. Quint moved to Mitchel County, Kansas in the spring of 1884, living on a farm between Beloit and Glen Elder. Here, six of their eleven children ere born. They made many friends and wee well thought of by the many good people in the neighborhood, doing their share of good deeds helping their friends. When they were preparing to leave Mitchel County in 1902, the neighbor ladies set together and presented Mother with a Friendship Quilt. This quilt was kept by Mother during her lifetime, then kept by Clara. After Clara's death, it was passed on to Jennie. Jennie presented it to the Graham County Historical Society. Since the Society at that time had no building in which to display articles given to them, it wa kept by Mrs. John Moore at her home. 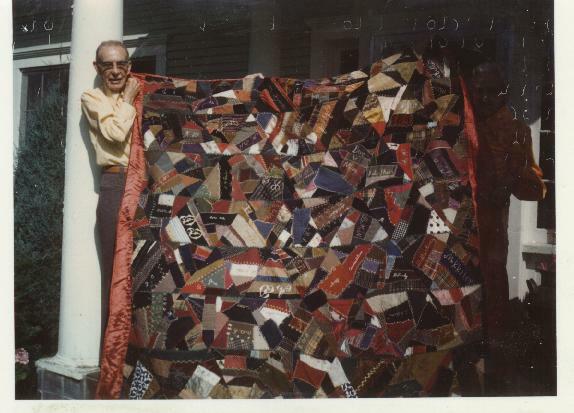 In 1973, while visiting in Hill City, Phil and I called on Mrs. Moore who very graciously brought out the quilt and had a photograph taken of it. Later Florence and Mabel borrowed the quilt in order to take off the names thereon. These names were embroidered on the different blocks in fancy stitches, and the quilt is quite colorful. Some of the blocks had only the initials embroidered, but Florence and Mabel were able to recall the names represented by the initials. Names recalled by Florence and Mabel were: Anna Olsen, E. E. Calder, Gertie Odle, Lee Neifert, Mrs. Darling, Maggie Adams, Mayme Hyman, Maggie Walters, Waive Brown, Irene Shurtz, Nettie Sanders, Ella Neifert, Dave Moss, Jeannie Quint, Mrs. I. Neifert, Mrs. Kate Moss, Mrs. Belle Quint, Maggie Riley, Mrs. L. Franks, Clara Quint, Cora Odle, Mrs. Anna Brown, Mrs. Jake Neifert, Mrs. Cross, K. L. Sell, Mrs. A. Anderson, Mary Moss, Olive Sanders, Grace Quint, Gladys Rector, Mabel Quint, Florence Quint, R. E. Olson, Myrtle Bulthaup, Nina Sanders, Hazel Quint, Callie Cross, Jesie Riley, Kate Darling, Elmer Quint, D. Luekey, Edna Neifert, Bessie Neifert, E. M. Darling, Myra Riegsigger, A. Darling, Mrs. I. G. bunch, Mrs. Neff, Ruth Shurtz, C. D. Quint, Katie Waters, Zella Brown, Mrs. N. Shurtz, Ina Rector.